From Trappist monks in the hills of Virginia, this creamed honey is a natural product of the finest clover. Whipped to a smooth consistency, it is easy to serve or measure. Available in plain or five delicious varieties, they add sweetness and flavor to hot tea and cereal. Wonderful when spread on bread, toast, pancakes, bagels or waffles. The Abbey of Our Lady of the Holy Cross is a monastery of the Cistercian Order of the Strict Observance (Trappists) which was born out of fire. When the monastery of Our Lady of the Valley in Valley Falls, Rhode Island, tragically and spectacularly burned to the ground on the night of March 21, 1950, the monks of the abbey were left without a home. While they labored to re-establish their community at a new site at Spencer, Massachusetts (St Joseph's Abbey), plans were also developed for a new foundation. A site was found in the Shenandoah Valley of Virginia on land originally surveyed by George Washington. 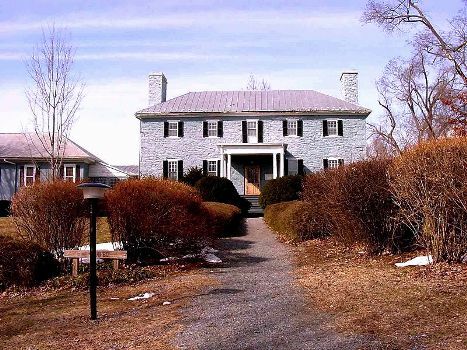 A fieldstone house built in 1784 as a hunting lodge became the centerpiece of the new monastery. Products of Holy Cross Abbey include creamed honeys, chocolate truffles and chocolate-covered pieces of fruitcake called "Fraters". The Monastery Bakery, where the monks make their fruitcakes, is the Abbey's chief means of support. Hospitality in the form of retreats and spiritual direction is offered at the Abbey Guest House. The Cinnamon Creamed Honey has been an essential in my kitchen for years. I love putting it in my Greek yogurt as a sweetener. My granddaughters prefer eating it straight from the jar. I use the almond creamed honey in my morning smoothie. Delicious! One reason I like this honey so much is because it is not gooey and sticky like regular honey. It spreads easily on toast, biscuits, bagels.......or whatever you want to put it on. The flavors a like and delicious! Lovely honey - delicious in tea or on toast. Thank you so much! Jul 13, 2017 | By Joe S.
I purchased the creamed cinnamon honey from the shop at the Abbey of the Genesee in New York (they make great bread!) and was so pleasantly surprised by it! I eat reasonably healthy, and prefer an occasional spoonful of honey instead of candy. This does the trick perfectly. I will definitely be ordering more! Great flavor. Wife puts in her coffee. Her blood sugar stays normal with use. May 7, 2017 | By Shelley R.
I love honey on Toast & in foods instead of sugar. Being creamed it's a ++! Mar 17, 2017 | By Laurie C.
Jan 8, 2017 | By jo B. Serve warm over a soft St. Andre Cheese and it is down-right heavenly! The most spectacular honey you will EVER taste. I mean EVER. All of the creamed honeys from Holy Cross Abbey are wonderful! I have been ordering this honey for years for myself & for gifts. Love it! Sep 17, 2016 | By Mary S.
This Brandy Cream Honey is out of this world. I absolutely love it. It is worth buying. Aug 8, 2016 | By Joy B. My granddaughters and I love the cinnamon creamed honey! I eat it with my yogurt several times a week. They eat it on a spoon. Jun 24, 2016 | By Alice C.
Our family loves these honeys. They are absolutely delicious! So far we have tried the plain, the raspberry and the orange, actually, two versions of the orange flavor, one in a jar and one in a tub - gorgeous! You won't be able to stop eating them. Thank you Monastery monks and nuns - we love your products. Jun 10, 2016 | By Patrick B. We have tried the Cinnamon, Almond, Blueberry, and Raspberry Holy Cross Abbey Creamed Honey. Although all are very good, we especially like the raspberry because it has, by far, the most robust flavor of all we've tried. I'd recommend your favorite flavor and enjoy. May 14, 2016 | By Carol C.
This honey has a smooth, creamy, silky consistency that is glorious. The flavors are rich and fresh tasting. Spreads perfectly, simply the best! Apr 27, 2016 | By Patrick B. Of the three flavors we tried, both my wife and I agree that this was by far the very best and almost impossible to stop eating. Will definitely be buying this product again! Creamed (or "spun") honey is always good. I love a great quality honey and this is it. I'll be buying it again. Could use more cinnamon; but, that's me. My wife thought the cinnamon flavoring was perfect. Guess who wins that debate! Creamed (or Spun) Honey is always good and I love it. The best for cheese boards! We discovered this honey a while back at a vineyard, on a cheese and fruit board. We liked it so much, we remembered, and have continued to buy it! It makes a great gift. It has a thicker spread than regular honey, created just by whipping it, so it's nice on crackers, scones, breads, etc. Really delicious. We have tried the brandy flavor as well, which is also very nice. We keep it in the fridge, and it doesn't seem to expire. Jan 13, 2016 | By Marlene D.
The Christmas Gift made up of the items above was well received and rated excellent! I have really liked honey since childhood and this brand is excellent. I will continue to order. This honey / cinnamon is creamy & delicious! Great additive to toast, French toast, & waffles.